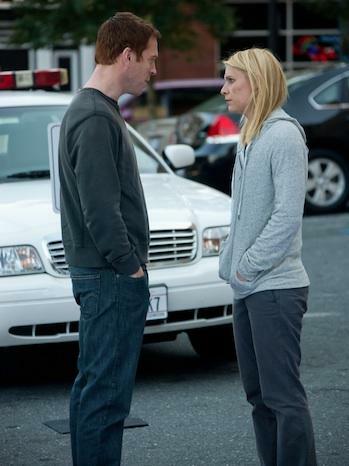 Damian Lewis and Claire Danes in Homeland. Last night, immediately following the season finale of Homeland, June Thomas and David Haglund had an IM chat about the show; an edited transcript is below. Warning: There are many spoilers ahead! David: Well, I’m a bit shaken. As Alyssa Rosenberg has just tweeted, “If anyone wants to come over and give me a hug after that #Homeland finale, well, I could use it.” That sounds about right. June: We all need a Virgil to help us! Carrie and Brody both panting audibly as they fought off panic made me incredibly anxious. David: The most anxiety-inducing part for me was when Brody was on the phone with his daughter. That was excruciating! David: So, what did you think of the finale? June: Ten minutes after the show concluded, I’m still incredibly tense. That was a very effective 90 minutes of television. David: Tense is the right word. I have issues with the show, which we can discuss, but purely on the level of plotting, I thought the finale was extremely effective, and it did get to me—made me feel anxious, on edge. June: I feel the same way. I have some questions, some concerns, some annoyances, but I feel like I’ve just stepped off a roller coaster, and it’s amazing when television can produce that kind of physical sensation. What were the peaks for you? David: The episode really picked up for me when Carrie went to Brody’s house. I thought the first half-hour or so of the finale was actually fairly slow. But that confrontation between the daughter and Carrie grabbed me. I really didn’t know what was going to happen. June: I felt the same way. Brody’s video testimonial, which ate up a lot of time at the start of the show, felt very rote, and not terribly compelling. (Although, while I found the video dull, I did like that it was unclear at the start if it was a suicide testimonial or a sort of campaign ad—of the sort Brody will soon be making.) I was caught up when Tom Walker so effectively carjacked the woman who lived so close to the site of Walden’s announcement. But Dana was the highlight. There were several moments where she had the power to change events—to make him change his mind. One was when she found him praying. I considered briefly if he might harm her. (Very briefly, since that would bring everything to a halt on every level.) Then she knocked on his door as he was putting on his vest. Did that cause the malfunction in the safe room? David: I wondered about that. June: And finally when Carrie tried to get her to intervene. It proved once again that Carrie understands things that others don’t (though of course she had information that others lacked, which she’d gained in her romantic walks with Brody when they were sleeping together), but also that there were other forces at work. It wasn’t some supernatural effort by Carrie, Jack Bauer-like. It was believable psychological profiling. And she was right! David: And the malfunction was clever plotting: Now everyone will continue to doubt Carrie. David: And it seems smart to have the daughter start catching on—because it’s psychologically plausible that she would be in denial about what her father has become, even with all she’s seen. June: Very true, but would she really have been able to get a phone call to him under those circumstances? And would the agent just leave him with his phone? And would Brody really have so many chances to hit the switch in such a small, intense gathering, full of Secret Service agents? David: I sometimes wonder if Secret Service agents are really as supernaturally skillful as TV and the movies always suggest, but yeah: You’d think in those close quarters, with all of them on high alert… Someone would have noticed something. And what did he do with the vest in the end? Did he just walk out of there with it? June: That’s one of my big questions. Also, where’s his video testimonial? Did he remember to take it from Tom Walker’s body? Or did Tom already get rid of it? David: The show should really bring back the video at some point. Maybe it becomes blackmail material. June: Tom Walker seemed like the more reliable, competent actor. From Abu Nazir’s point of view, it’s too bad their roles were reversed. David: It seemed a bit odd, really, that Nazir chose to keep Brody alive, rather than the guy who actually did his job. On the one hand, Brody is now in a position of power—and will soon become more powerful, presumably. On the other hand, what will they accomplish with Brody in office (and possibly having the president’s ear)? I mean, what do they actually want to accomplish? I imagine the writers will struggle to answer those questions next season. June: Agreed. Nazir said, “Why kill a man when you can kill an idea.” But what idea are they fighting for? That’s never made clear—especially since Brody’s motivation is framed as a very personal one. Issa is his motivation rather than religion or ideology. One thing that bugs me (though it gives us something to look forward to next season, I guess): They didn’t even mention the mole in the CIA. We know that there was one—the murder of Brody’s captor, the warning off of the Saudi-U.S. couple who bought the house near the airport—but it was just sort of overlooked. I always suspected David Estes, and although we know he was plotting with the Vice President, what the mole did was far more serious. And Estes did have motive—he knew about the VP’s deception and of his horrible deeds. David: They have let certain elements emerge and then disappear in odd ways this season. Walker similarly went away for a couple episodes before then reappearing in time to play a crucial role at the end. People must have been trying to hunt him down, right? Also, the shooting at the mosque: That was a big deal, until it wasn’t, seems like. June: Yes, yes, and yes! And since when did fancy ladies with beautiful apartments overlooking the State Department go to play bingo? Whatevs! David: Still, the writers managed to craft a suitably dramatic ending, while also setting up Season 2. Just on that level, the show succeeded. They did not convince me that they are anything but opportunistic, though, which is my underlying problem with the show—not that it’s poorly done, or that they won’t be able to sustain it, but that the show is ultimately not serious. And maybe some people will say, “Of course not! That’s a ridiculous expectation to have.” But while I have enjoyed various aspects of Homeland from the beginning, that is a real barrier for me. I have a hard time watching a show take serious material and treat it in a way that feels ultimately, to word it more strongly, cheap. June: That’s interesting. What sorts of things are you thinking of when you say they’re unserious? David: Well, take Carrie’s mental illness, for instance. She’s bipolar. And, at the end of tonight’s episode, she has electroconvulsive therapy, a treatment that has reemerged in recent years as a viable if extreme option in cases of severe depression and other forms of mental illness—though it is still associated by many people with less enlightened ages of treatment. The show seemed to handle it reasonably well—though Saul does come in and call it “barbaric,” and no one directly challenges that declaration, as I recall—but it feels like a plot device. And that bothers me. June: That seems right. Though I can’t help thinking that the way the audience is being haunted by the final scene (judging from Twitter) is of a piece with the way Carrie was haunted by her failures. The fact that I am ready to give the show credit for that suggests it has won me over. June: Certainly his hiding his faith was annoying. Yes, if people knew he was a Muslim, some of the opportunities he had—to run for office, to become close to the VP—wouldn’t have come his way. But when he did tell people (Carrie, Dana), there was no backlash or negative response. Just concern about his hiding things. David: It does make me wonder if his Muslim faith will come out publicly next season, either during the campaign or after he’s in office, and how the show will handle that. Both Carrie and Dana know, so how long can he plausibly hide it? And, realistically, he would lose the election if that came out. June: He would! And perhaps having Brody’s motivation be essentially personal revenge (for the death of Issa) rather than religious belief or ideology was also a copout? David: Well, how is blowing up a bunch of people revenge? June: When I say “revenge,” I mean that in a way he was behaving like a vigilante—like the dude in Gladiator. It wasn’t that he was offended by the Roman Empire, but by his wife and kid being killed. Brody’s revenge seems similar. The people he targeted weren’t random—they were people who had either been in the room (like the Secretary of Defense) or who were responsible for the policy of using drones to kill, and allowing for some collateral damage. David: So does that feel plausible to you? Do you think this is ultimately, in some sense, a serious show? Or do you not judge it in those terms? June: No, I do want to judge in in those terms. That does matter to me. And I think ultimately it’s not serious, but it has been very clever—more clever than any other show that I can think of right now—at addressing issues around national security, returning troops who have been through hell and are just thrown back into the world without much support, the role ambition plays in the intelligence services… And it was HUGELY effective emotionally. I think that’s due to the excellent acting from the leads, but the creators did try to address questions of health, faith, the insanity of running for office, etc. David: Yes, the acting plays a major role in the show’s credibility, such as it is. Claire Danes is very good, and very compelling on screen. Ditto for Damian Lewis. David: I think he’s a good guy. I hope he’s a good guy. The fact that he may not be is, for me, a testament to the ultimate un-seriousness of the show. But he’s another great small-screen presence. June: I wonder if we can ever have a completely convincing show about the intelligence and Homeland Security world. You are always subject to speeches about “handing the enemy its greatest recruitment tool since Abu Ghraib,” or collateral damage. Those concerns are real, but it feels like they’re being used cheaply. It boils down to “The dude who says that is a douche,” not a serious contemplation of the issues. David: Saul unveiling those DVDs near the end was interesting—the supposedly destroyed torture tapes. I mean, that’s a huge news story that seems to have dropped from public consciousness entirely. The show grabbed my attention again by making those a potential plot point for next season. It’s funny how after all this we’re basically back where the show hinted it was going at the beginning: Brody is “a terrorist” of some kind, a sleeper agent, and he’s running for Congress. Nazir is indeed playing “the long game,” if not entirely by choice. June: Well, as Nazir said, “The end of our life is preordained”—and so is the plot, I guess. But now we don’t have Carrie to protect us—and Carrie may not be the same after what happened in that final scene. Overall my response is still very positive. Homeland took me on an emotional and intellectual journey. I don’t think it succeeded completely, but I still respect the show. And the acting was remarkable. June: Finales—even of seasons—are often a letdown. This wasn’t—its faults were the same faults it has had since the beginning. David: Yes. Clever plotting, a questionable connection to reality. Oh, and very good acting. That’s how I see it, anyway. June: I feel like a bit of a myna bird tonight, but I agree.